Any time of year is perfect for putting your slow cooker to use, but when temperatures are so hot that you don’t want to put on the oven, it’s even more perfect. My favorite slow cooker recipes are those that allow me to put the ingredients in and turn it on– no messing up other pans, and minimal prep– AND has a long cook time, so that I can assemble everything in the morning and go about the rest of my day. 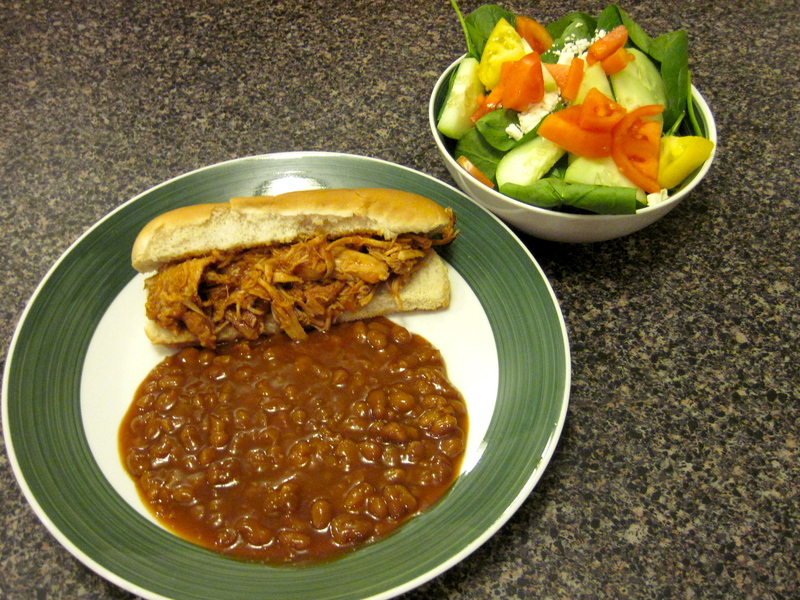 This one, by Hungry Girl, not only meets all of those criteria, but it’s also a perfect summer dish– Barbecue pulled pork. Some baked beans and salad or coleslaw on the side, and you’ve got full meal. You can see the original recipe here. Hungry Girl is a great site for recipes, and doubly so if you want a caloric count, or if you’re tracking carb intake or following Weight Watchers. She also makes a great foldable flat bread that you can buy in supermarkets. I modified her recipe slightly by using less onions, Splenda brown sugar blend, and using only a pork tenderloin. 1.5 lb. raw boneless pork tenderloin, trimmed of fat. 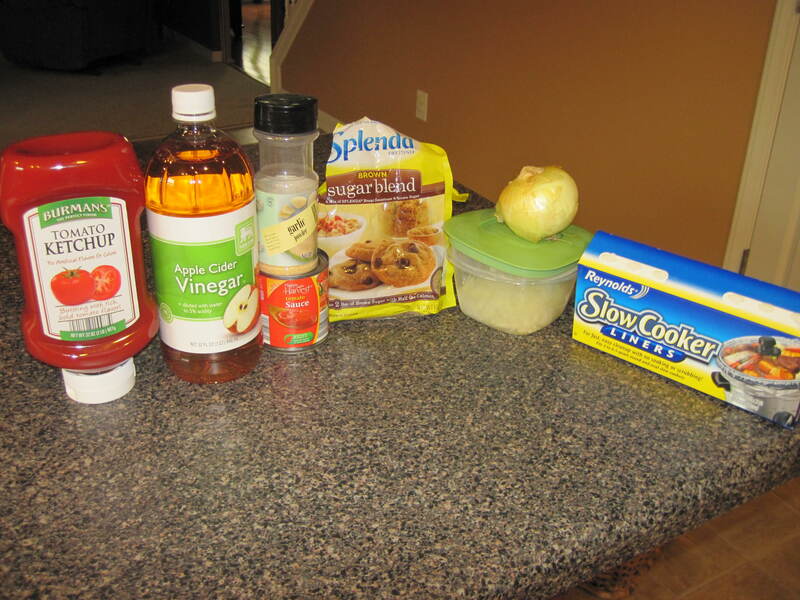 You start by making your own sauce from ketchup, apple cider vinegar, garlic powder, brown sugar blend (if you use regular brown sugar, double the amount you add), and, if you want to make clean up a breeze, a Reynold’s Slow Cooker Liner. 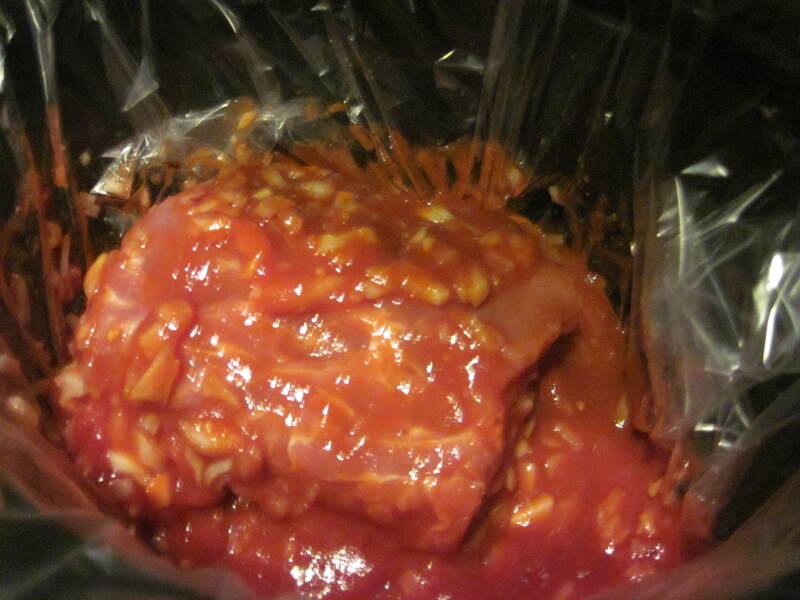 You just pop the sauce ingredients directly in your slow cooker. Stir them together thoroughly. 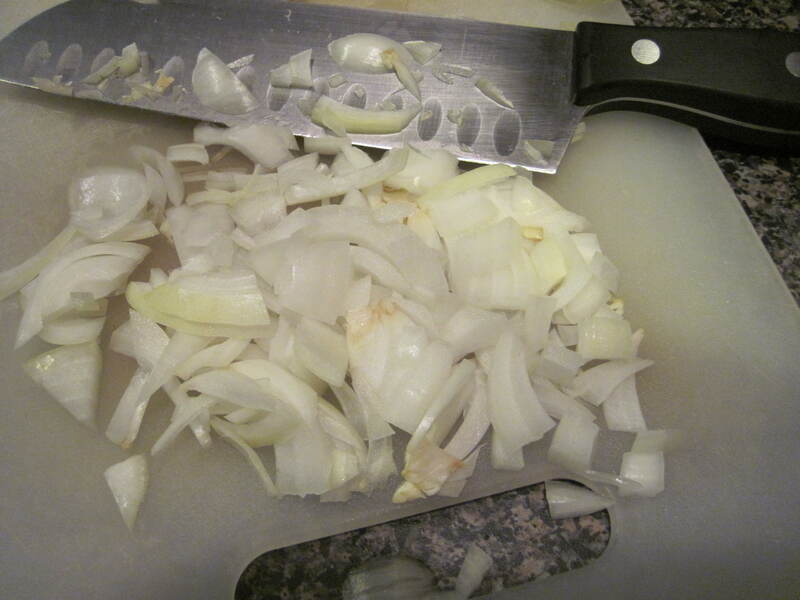 After stirring to combine your sauce ingredients, add your chopped onion and whole pork loin. The big old chunk of it. Roll your pork loin around to coat it and the onions in sauce. You want the flavor to get into every bit of the meat. 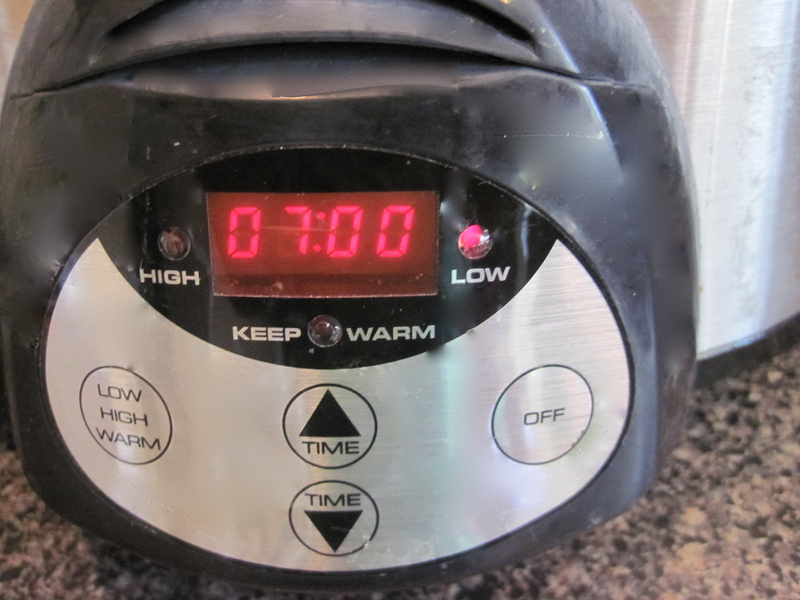 Turn your slow cooker on for 3-4 hours on high or 7-8 hours on high. You’ll smell everything cooking up nicely. Your friends will comment on how delicious it smells. Tell them how easy it was to make, they’ll love you for it. 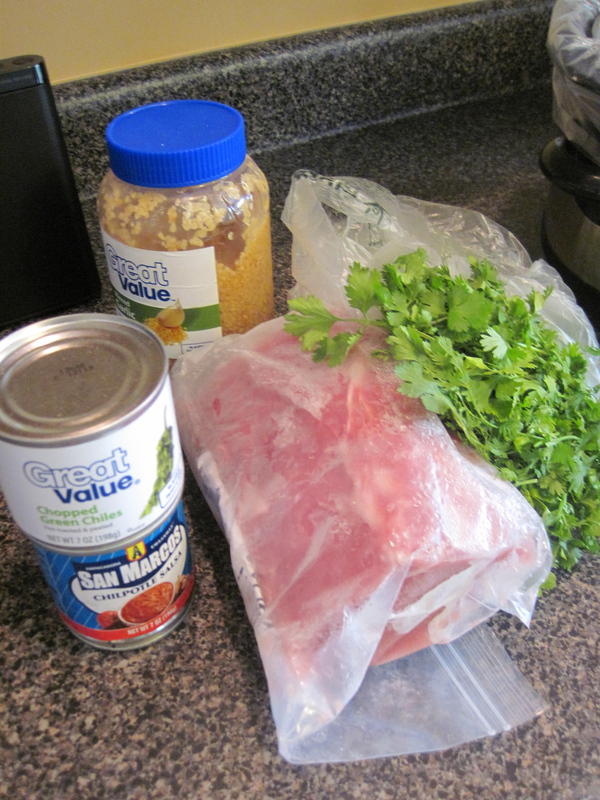 When it’s cooked through (pork should be cooked to a minimum internal temperature of 145 degrees), carefully remove the pork loin and place it in a large bowl. Shred the pork using two forks. Just drag the forks through the meat. It will shred easily if it’s thoroughly cooked. Shred it nice and fine. 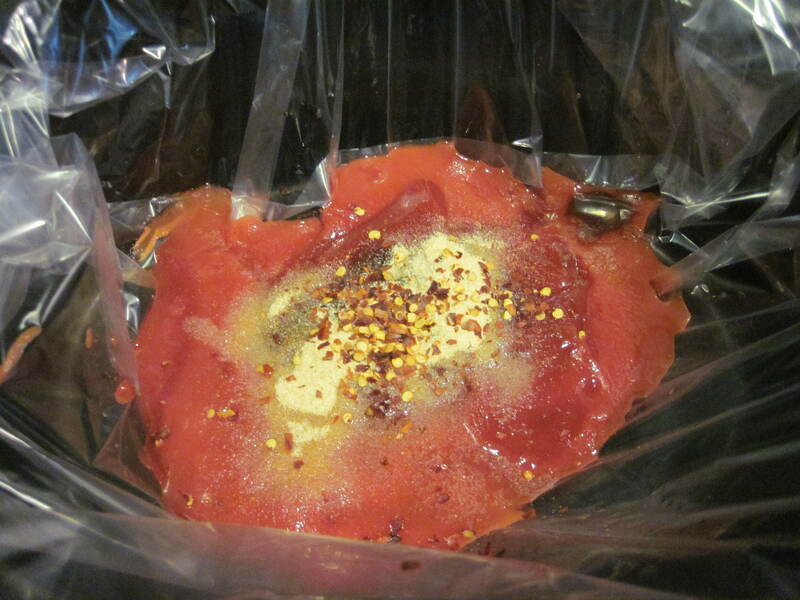 Then return it to the slow cooker and stir it into the sauce and juices. Coat everything evenly. I eat mine plain or on a bed of lettuce (I call it barbecue salad), which saves me a few carbs and calories. My husband and boys eat it on hotdog or hamburger buns, depending on what’s handy. It’s good on anything. And it makes a lot, so you could even score lunch leftovers out of this minimal effort dish. If pork is not your thing, try using the same sauce and substituting boneless, skinless chicken thighs for the pork tenderloin. Just keep in mind that the internal temperature of chicken should be 165 degrees when it’s fully cooked. 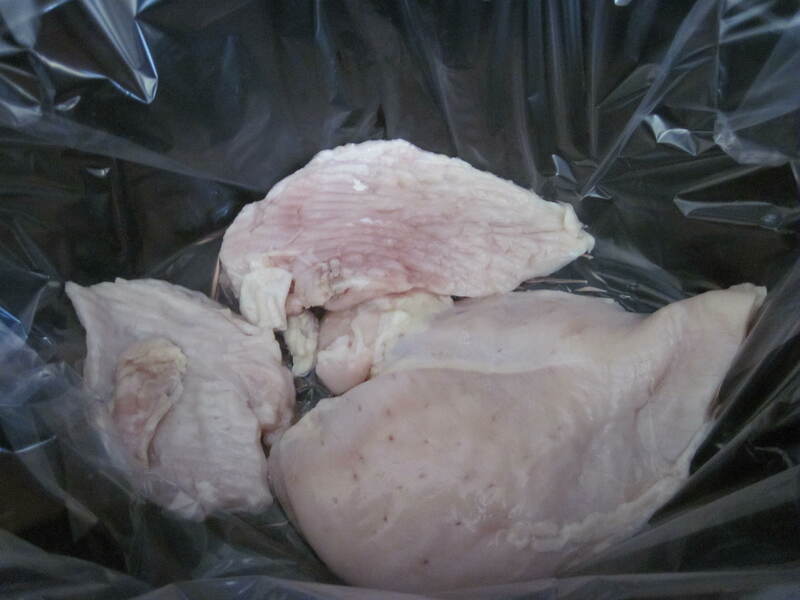 I’ve used frozen boneless, skinless chicken thighs in similar recipes, and set the slow cooker on high for an hour, then decreased the temperature to low for 6–8 hours. The chicken will just fall apart when it’s done. Little effort, no mess, and big taste. What are your favorite no fuss summer dinners? With Lent upon us, it seems to bring renewed interest among some of my friends for creative ideas for meatless meals. We have several meat free dishes that we enjoy (I try to cook meat free once a week), but I’m always up for new ones. ESPECIALLY if they can be made in the crock pot. 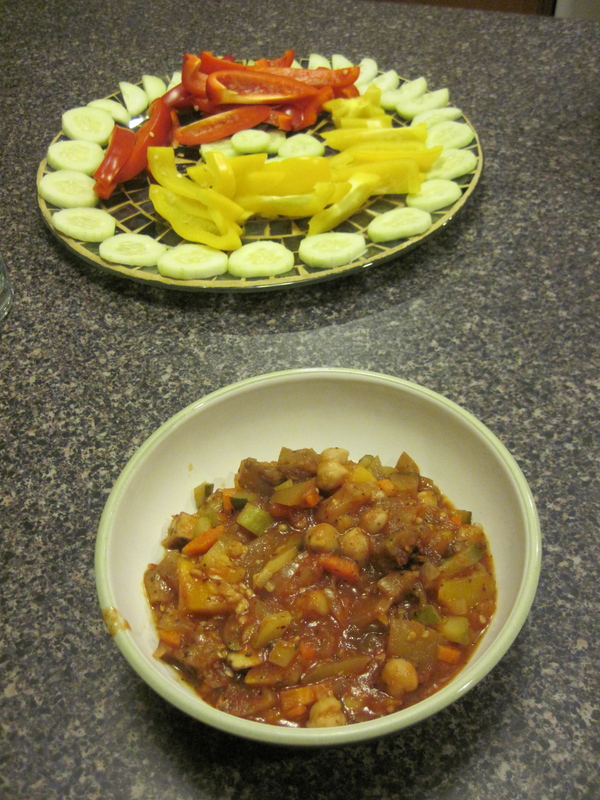 None of the vegetarian dishes that are in our usual rotation are crock pot dishes, so this Very, Very Veggie Stew, from Hungry Girl, sounded like it was right up my alley. I hadn’t heard of Hungry Girl until a few months ago, but that’s probably just because I’m out of the loop, because it seems that she is a pretty popular woman. She’s not only a New York Times Best Selling author, but she’s also the host of her own television program, which airs on two channels. 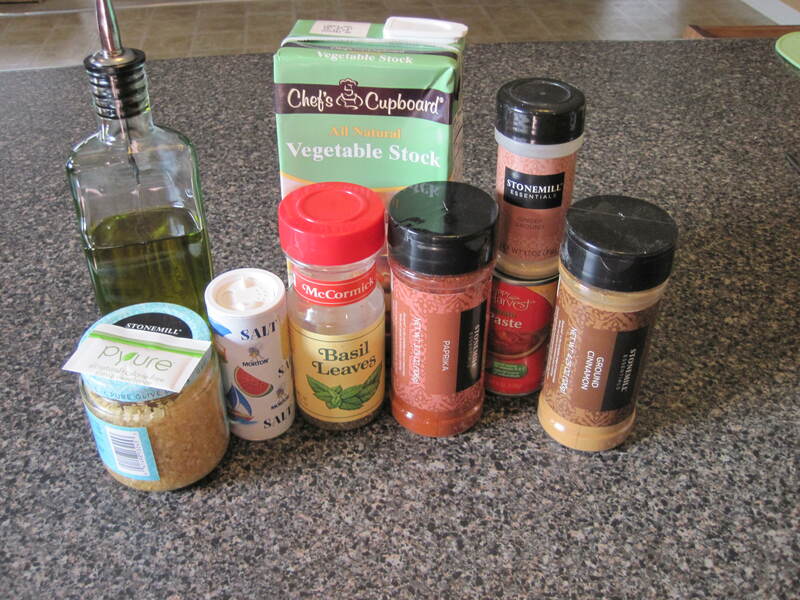 In addition to that, she has a food product line that you can find at your local grocery store, including a lower carb whole wheat and flax flat bread, which I used to make my personal pizza using Knock Off Papa John’s sauce a few weeks ago. Hungry girl lists the calorie count, the number of weight watchers points, and the number of carbohydrates for the recipes that she creates, which is helpful if you’re keeping track. One of her books highlights 200 recipes with under 200 calories per serving, which I think is a pretty impressive feat, considering that two pieces of regular old bread can contain more than 200 calories. 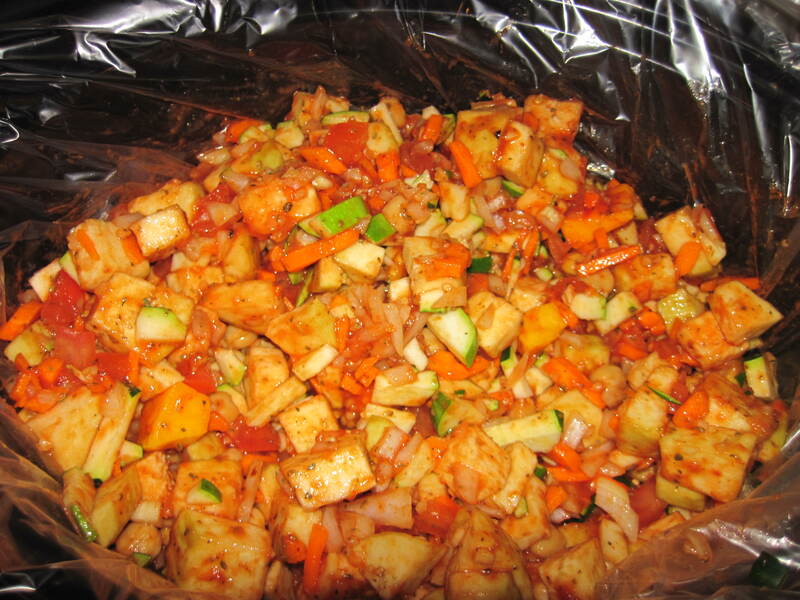 Garbanzo beans, onion, eggplant, zucchini, tomato, carrot and butternut squash form the bulk of this healthy dish. 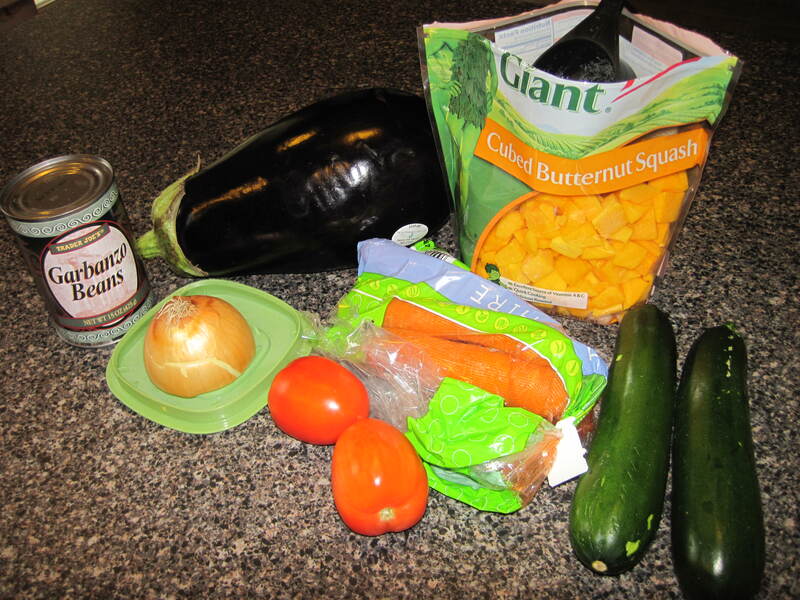 Peel the eggplant, do some chopping and toss everything in your crock pot. Next, gather your tomato paste, spices and broth. This recipe uses a good amount of flavors that I wouldn’t have thought to use together. 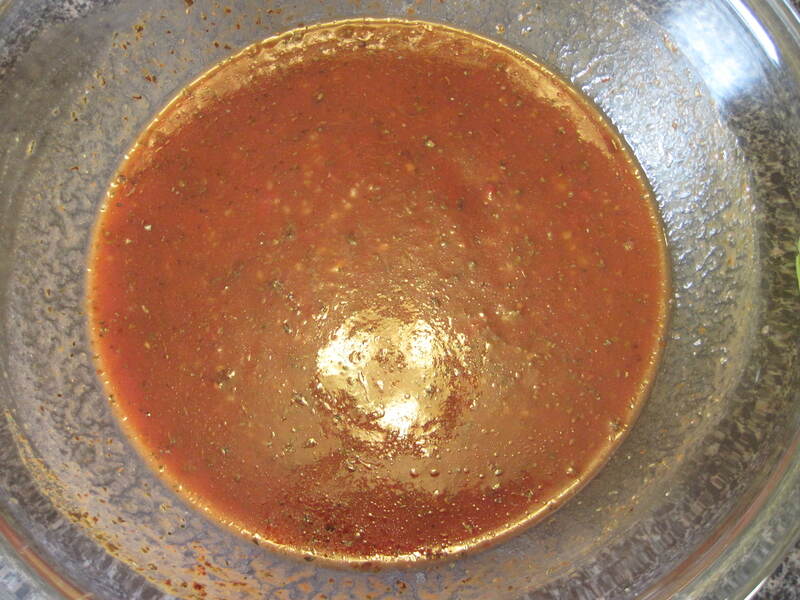 Olive oil, vegetable broth, tomato paste, garlic, salt, basil, cinnamon, paprika, ginger, and a no calorie sweetener packet (I used trulia, but you could use whatever you like, or even regular old sugar if you don't mind a few extra calories). Mix them all together in a big bowl. 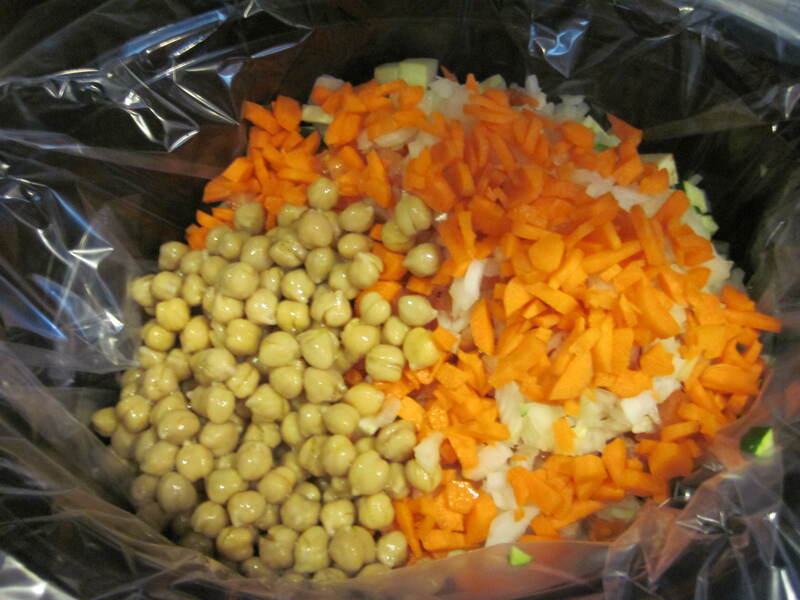 Then pour them over your vegetables and beans, and stir them together,coating everything evenly. Yummmmm…. Cover and cook on high for 4 hours, or on low for 7-8 hours. 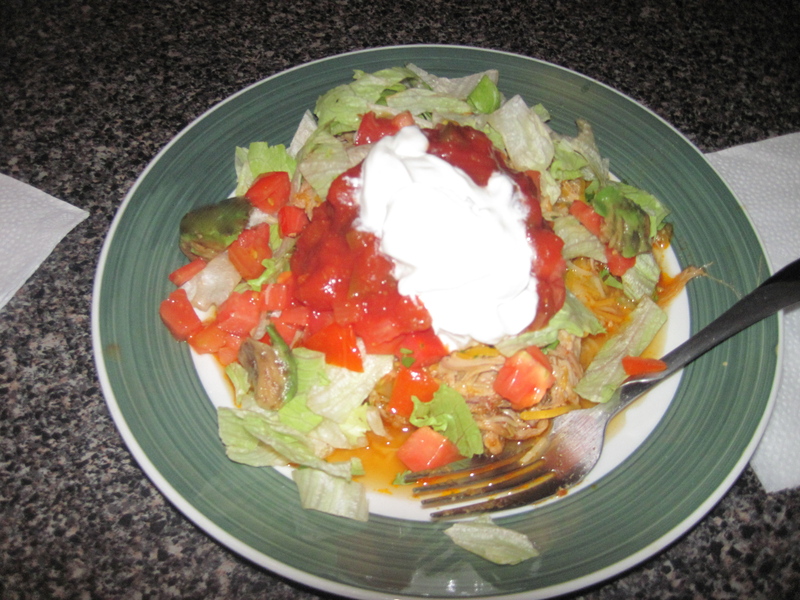 I cooked it on low, because I generally plan our menu to use the crock pot on days when I am going to be gone all day. The house smelled amazing when I walked in the door that evening. I served this with a side of raw, cut veggies and store bought french onion dip. My husband said that it “needed something”, which, while nondescript and not entirely negative sounding, is one of the only things he’ll ever offer in terms of negative feedback about a dish that I make– although, he couldn’t suggest what he specifically thinks the dish is lacking. Christopher said that it was just “ok”. His Majesty ate cucumbers and peppers and only a few spoonfuls of the stew, but that isn’t saying much, since some days, he doesn’t eat much for dinner, regardless of what is served. 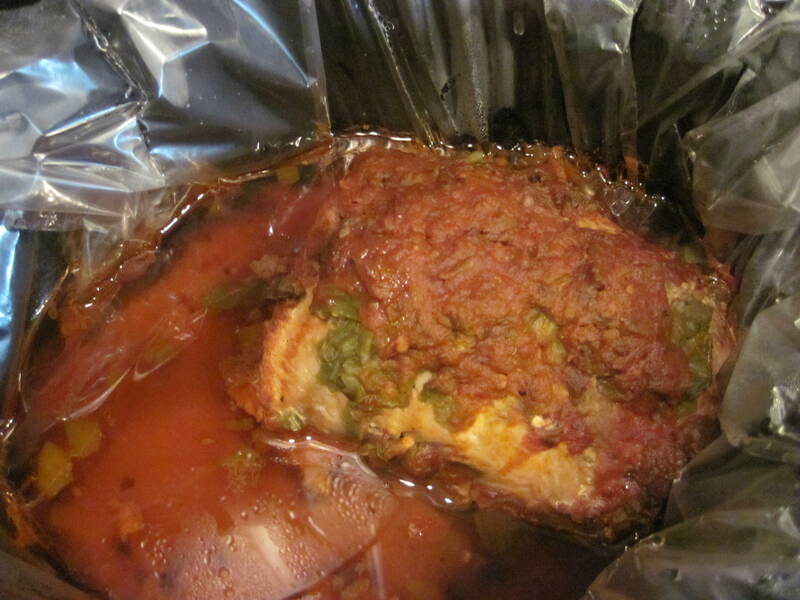 It got eaten, but not as enthusiastically as some other dishes. The recipe, as I served it (generously) made 3 large servings, one small toddler serving, and left a big serving that I happily enjoyed for lunch the next day. I love leftovers. But I was so bummed as I finished it off, because I REALLY liked this dish, but I know that I won’t add it to the menu again if my guys don’t like it. For me, nothing is worse than preparing a meal that no one enjoys. I’m thinking of adding meat to it, maybe a beef, and keeping the spice/broth/tomato paste combination the same, maybe that will jazz it up enough for them to like it… Do you have any suggestions for how I can salvage this dish so that everyone can enjoy it as much as I did? Is there anything that bacon can’t make better? Our state fair actually puts bacon on a stick and covers it in chocolate. I’ve never tried it, but I tell you, I love bacon enough that someday, I might be willing to give that concoction a taste test. Ironically enough, I didn’t eat meat for nearly 15 years, and so I honestly think that my propensity to eat large quantities of bacon is my body’s attempt to make up for all of that lost time. As the name implies, Bacon Ranch Chicken couples bacon with another food miracle: ranch dressing. Seriously: ranch on a sandwich, ranch on veggies, ranch on chef’s salad, ranch on pizza, yum-yum-yum, ranch is pretty much universally applicable to non dessert dishes. Lucky us, this dish has both ranch AND bacon. Plus it goes in the crock pot and takes less than 4 hours. Are you kidding me?! In my house, this is perfection. It doesn’t get much easier than this. First, you get yourself some boneless skinless chicken breast, and gather the rest of the ingredients. You could probably use chicken thighs if you wanted to. 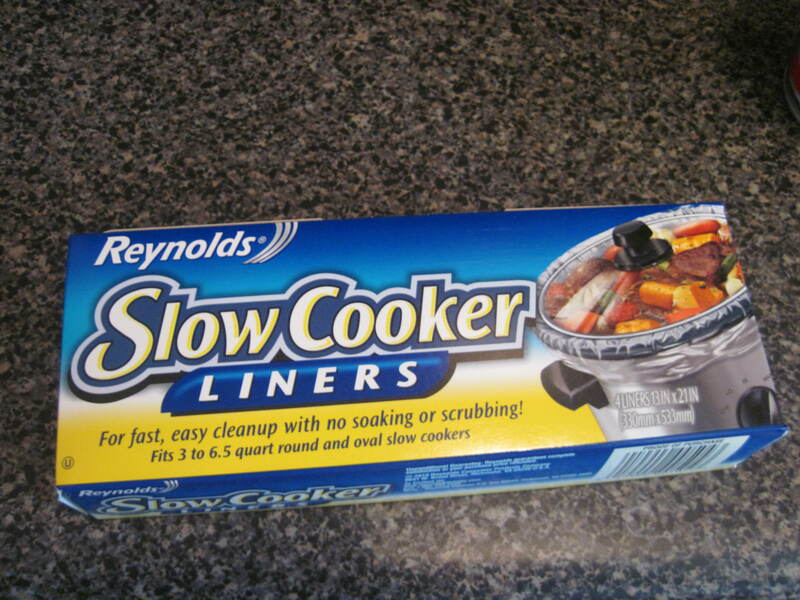 Don't forget your crock pot liner, unless you want to spend a half hour scrubbing out the crock pot tonight! 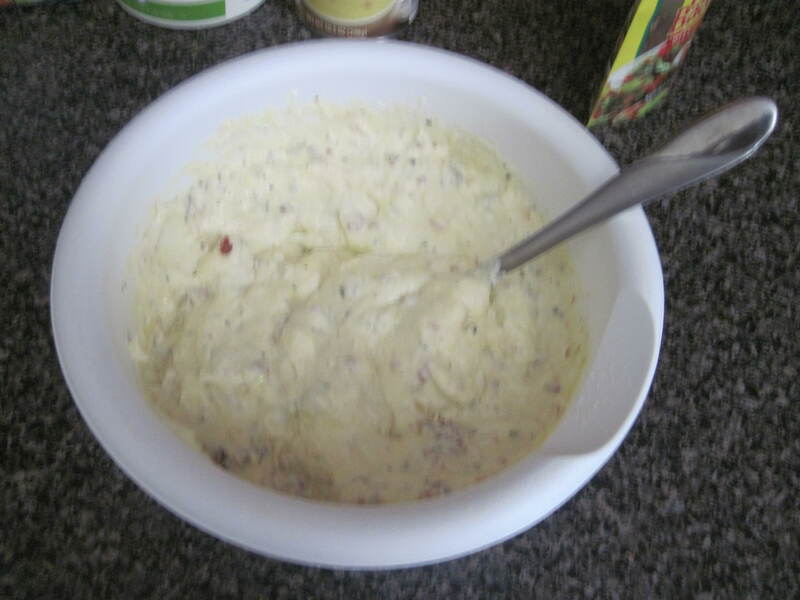 Then mix up the other ingredients (sour cream, soup, garlic, ranch mix, and bacon bits) in a separate bowl, so that all of this deliciousness is thoroughly combined. Now here’s the hard part. Spread it all over your chicken, scraping every last bit out of the bowl, cover and set your crock pot on high for 3-4 hours. I always test my chicken to be sure it has an internal temperature of 165 degrees F. After verifying that it’s reached a safe temperature, I use two forks to shred the chicken breast. It falls apart really easily. 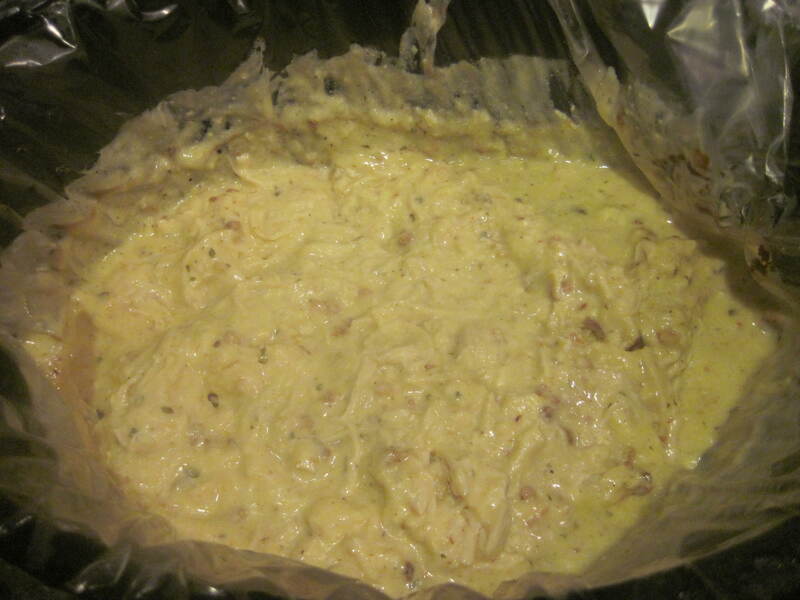 The sauce will be nice and creamy, like an Alfredo sauce, only better, since it is made with bacon and ranch. 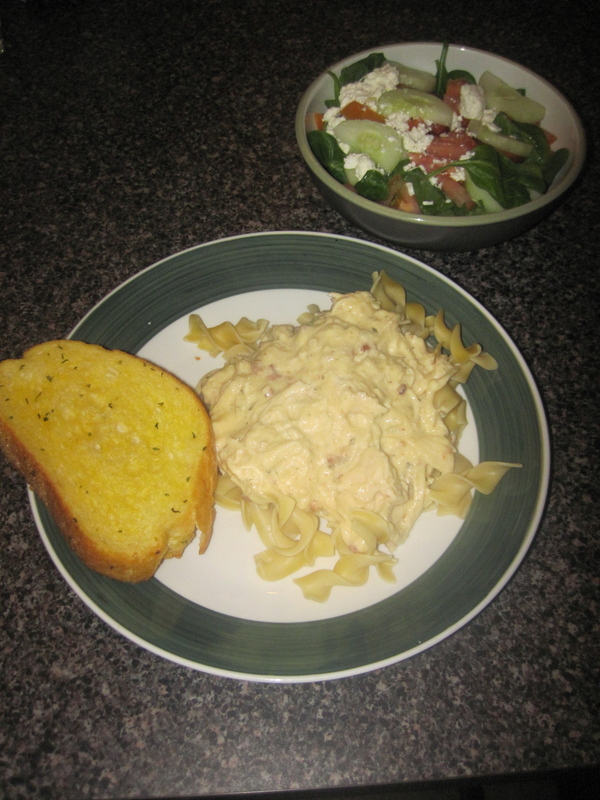 I served it over egg noodles with garlic toast and a salad on the side for my guys, and I skipped the noodles and the bread, saving myself some carbs. It’s great either way. Have you added bacon or ranch to anything lately and had it rock your socks off? If so, you know I want you to share the recipe. 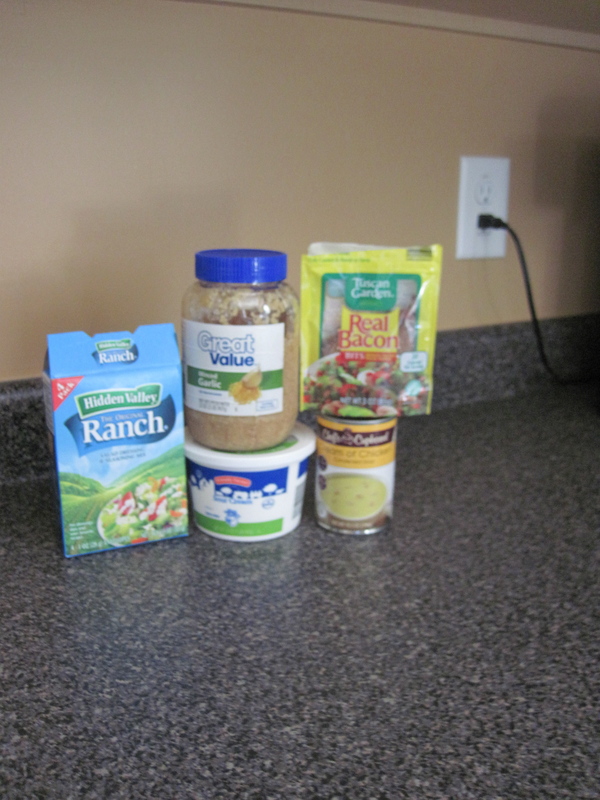 Or, have you made Bacon Ranch Chicken for your family? What did everyone think? I’m convinced that it is a universal truth that Mondays are crazy days. In my house, we all kind of have to reset ourselves after having had extra down time on the weekend. Christopher muddles over the necessity of doing lessons, His Majesty wakes up asking for Daddy, and spends the first part of his day looking for him, and I have to catch up on whatever tasks I neglected over the weekend in favor of embracing and enjoying the extra time with my family, plus keep on top of my daily tasks. Add that to the fact that homeschooling actually doesn’t involve as much time at home as one might assume, and it’s pretty nuts around here. 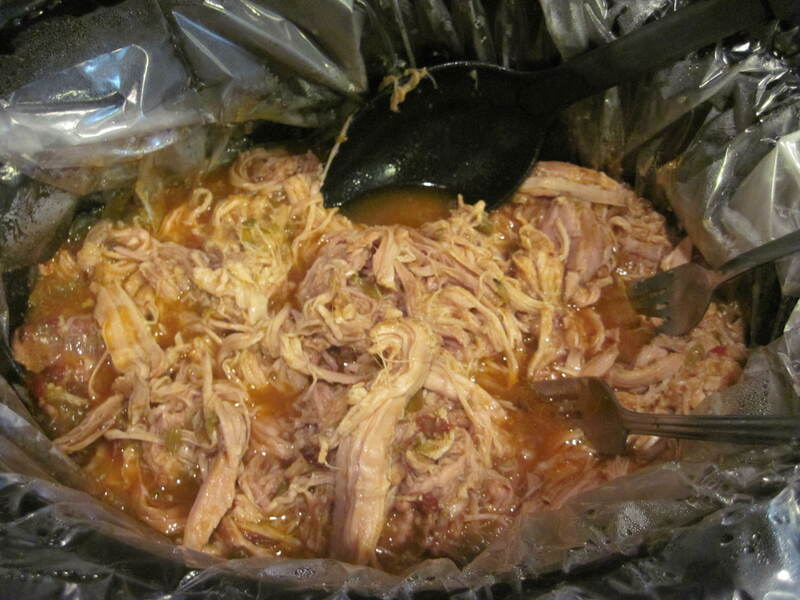 Because of this mania, Monday is often a crock pot kind of day. And Pinterest is absolutely loaded with crock pot ideas. 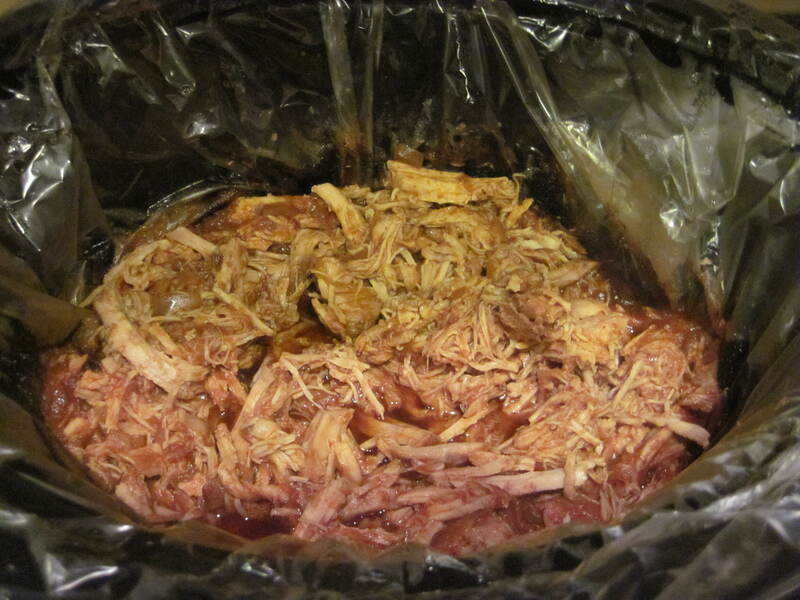 One of our favorite crock pot dishes is Mexican Pulled Pork. It is easy, versatile, and delicious, plus, it makes so much that we end up with leftovers, which makes it even more spectacular. Plus, it is great if you work, because it has a long cook time. Garlic, diced green chiles, chilpotle salsa, cilantro, and a chunk of pork loin. They make cleanup a breeze. We get them at the grocery store, down the aisle with the tin foil. Ok, so chop your cilantro and toss it in the fridge for later. I like to do as much prep as possible in the beginning of the day, so that when the 5pm “witching hour” is upon us, there is less to worry about. 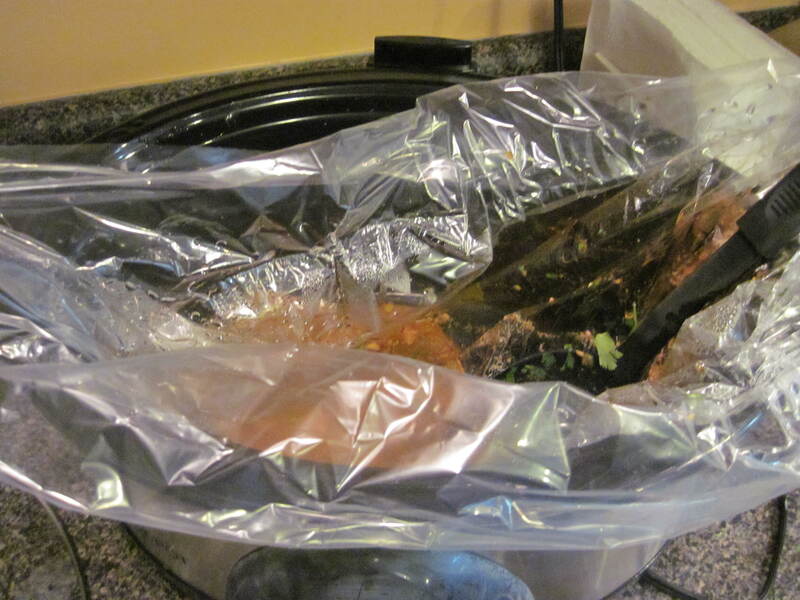 Then, stick a liner in your crock pot, throw in the pork loin (Mine was about 2.5 lbs, and made 6 generous servings). I don’t cut it up in bite sized pieces. It’s going to be shredded anyway, and after 7 hours in the slow cooker, it falls apart beautifully, so I don’t bother with the extra work and mess of cutting it into small pieces. Anyway, throw in the intact pork loin. Then add 3 cloves of minced garlic and the entire can of diced chiles (mine came in a 7 ounce can, so I went with that slightly reduced quantity) to cover the top of the pork, and the dump the whole can of chilpotle salsa over everything. The original recipe calls for less, but I just don’t like to waste, plus, we like our stuff extra saucy, so it works out. 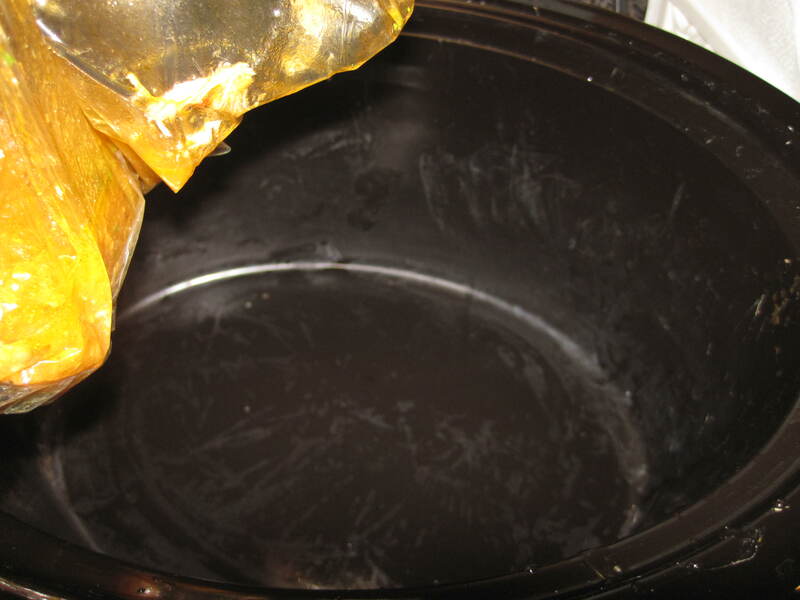 Add about 1/4 cup of water to the crock pot, cover it, and turn it on. 7 hours on low. And then go about your day. Towards the end of the the 7 hours, I always check the temperature with a meat thermometer. Pork should be 160 degrees F.
The smell is amazing. My oldest son practically dances around the kitchen in anticipation of this dish! Next, you want to make yourself some rice. I use minute rice. I know, it’s not “real” rice. But rice is essentially just a nutritionally void filler, so I don’t really worry too much about the fact that I serve a modified substitute for it once a month. Minute rice is easy. I make 4 servings, subbing 1/4 cup lime juice for 1/4 cup water, and then I add 1/4 cup of cilantro like the original recipe calls for.While you’re waiting on the rice to boil, shred your pork with two forks. Try not to tear the liner, though, or your easy clean up won’t be as easy. Still easier than crusted on food, but if you can manage, go easy on the liner. When the rice is done, you’re ready to dish it out. 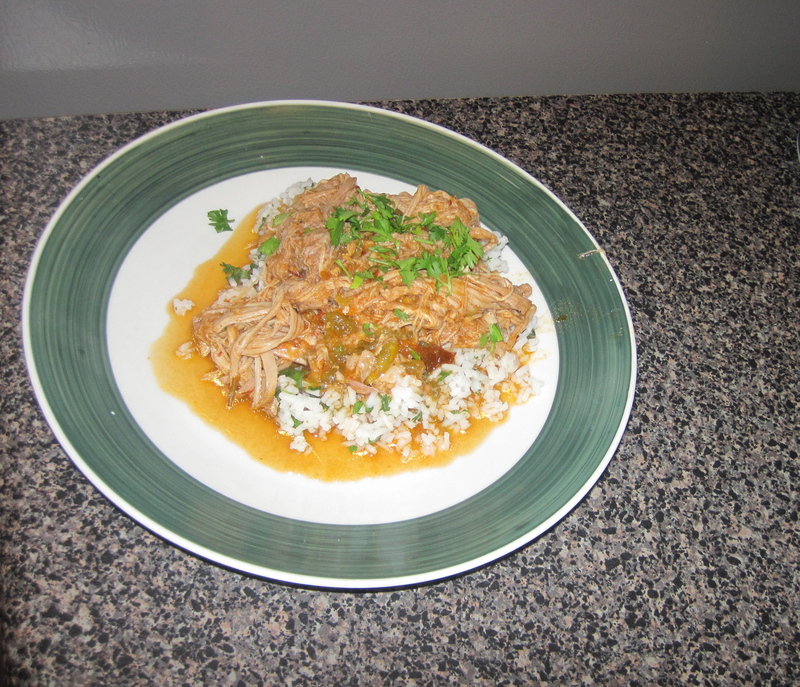 Mexican pulled pork over lime cilantro rice. Topped with cilantro, because cilantro rocks. My son has put his pork inside flour tortillas and eaten it like a fajita before, and that was really good too. Like I said, it’s a versatile dish. Pull your liner up slowly, in case you accidentally tore it. No scrubbing required! Just a quick wash and you're done! Anything to help Mondays pass just a little bit easier.